This recipe comes from Epicurious. It is a terrific example of how the fewest number of ingredients, and the simplest preparation, can taste really divine. For this, you’re going to want to find some really good tuna. Not the water-packed stuff, but the luscious olive oil-packed kind. The tuna belly, line or pole-caught stuff. Preferably from Italy, or Spain. You want the stuff that tapas bars in Spain serve out of a can with a toothpick, and charge you money for. The best tuna recommendations can be found here. This is a great little recipe to have in your repertoire. Tuna is a good staple to have in the pantry, and dinner can be on the table in just a few delicious minutes. 1. Set a large pot of heavily salted water to boil. When it starts to boil, add the penne. 2. Meanwhile, in a large bowl, combine the lemon zest, lemon juice, grated garlic, and tuna with the oil from the can or the jar. If you think there might be too much olive oil, pour off some of it into a small bowl or ramekin. You can always add more as needed. 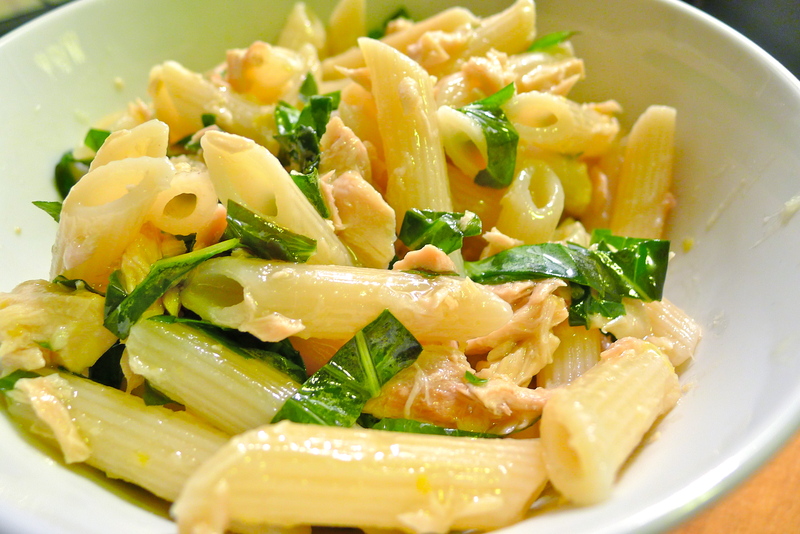 As you combine the ingredients together, break up any larger chunks of tuna into smaller one. 3. When the pasta is al dente, drain it and add it to the bowl full of the other ingredients. Toss everything together so that the pasta is well-coated with the sauce. Add the basil, and toss again. Adjust the seasoning if needed, and serve immediately.